Toy Story Midway Mania, found in Hollywood Studios, is an amazing piece of tech - a 4D shooting gallery attraction that feels a lot like a major beefed up version of Buzz Lightyear's Space Ranger Spin's concept. After putting on your 3D glasses, you're placed in a cart which zooms around it's rails on a preset route, stopping briefly as you face a series of screens where characters from the Toy Story films pop up and instruct you on what to do - shoot as many of the varying targets in each toy box setting with all kinds of projectiles, from darts to pies to baseballs. Each target has the amount of points it bestows to you shown on it, and of course the harder ones to hit are the ones you really wanna go for if you wanna build up your score. 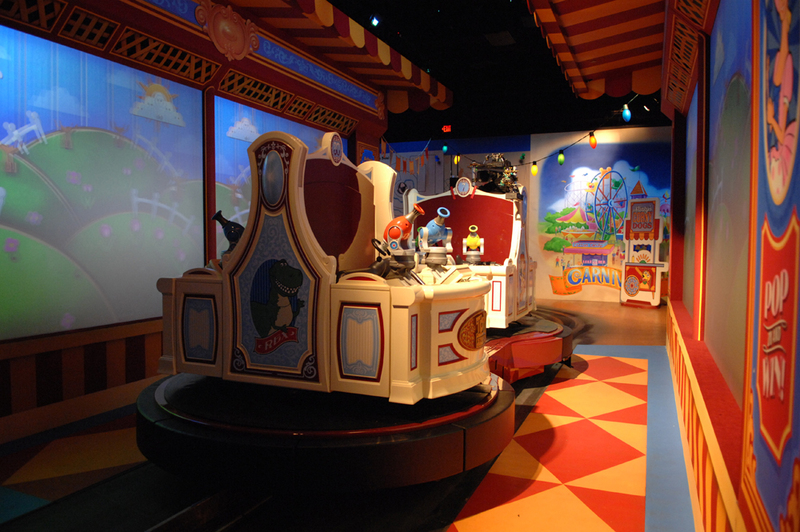 With some amazing, immersive technology, a fast paced atmosphere, and an overall exciting, cheerful vibe, Toy Story Midway Mania is easily one of the best rides the resort as to offer, and one that guests of all kinds of age groups can enjoy. If you read my original Disneyland Paris visit post from 2013, you'll know how much I love the Parisian edition of this ride - and whilst the Florida version is relatively similar in terms of track layout, it's theming is entirely different. Whilst the one in France is based on Aerosmith developing a ride featuring a music technology, meaning the ride is actually part of the story, this American version (which came first) is based on them leaving a gig in a stylised "really fast car", as worded by the stars of the show, and racing through the streets of Los Angeles. As a result, instead of the main room being filled with disco lights and smoke effects, you'll find yourself encountering all kinds of road signs, many warning you to stop, which of course the wreckless drivers are destined to ignore. Sound effects also add further atmosphere with revving engines and skidding tyres - but, also much like the French version, Aerosmith music is rocking on the on board speakers, adding further adrenaline. The ride also begins with an immense 60mph launch, straight into a direct loop which links into a corkscrew inversion, generating a crazy zero G effect and a thrilling floaty feeling. You then thunder along the rails at similar speeds, with one more inversion following this, reaching your sudden stop after one hell of a ride. As such, it's easily one of the best coasters I've been on, despite poorly managed queues that take aaaggeess even during low crowd periods. Stationed at Epcot, Test Track originally opened in 1998 under the sponsorship of General Motors, with the theming being a basic proving ground motor experience. 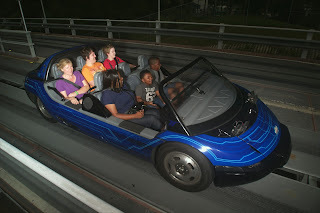 The ride closed in April 2012 for a major overhaul, reopening six months later with a new Chevrolet tag and a more complex, interactive design that, after another brief update, also makes extensive use of the resort's Magic Band scheme, introduced against guest profiles in 2014. Before boarding their test vehicles, riders actually design their own car on a touch interface, creating a unique vehicle with varying stats of speed and handling whilst also giving it an appearance that suits them best - the touch screen interface allows for a lot of freedom, making each design dramatically different among riders. It might not always turn out quite how you'd expect, but once it's over, you then board the aforementioned ride vehicle which zooms around a track to simulate testing environments for real cars, with your virtual car's performance against such circumstances appearing on a scoreboard as the ride goes on, ranking against the cars designed by other riders you're with. The final portion of the ride is a brief but epic run on the exterior circuit, at speeds of around 65mph, making it one of the fastest rides in Disney history. It's difficult to explain to those not familiar with the ride structure, but trust me, it's design is extremely intuitive and creative, building upon the already superb original with a host of necessary modern tweaks and thoughtful ideas. The main ride itself inside the dummy car is as tense as it is exciting, carrying you along sound stages designed to resemble outdoor environments with thrilling sharp turns and sudden jolts of speed. Definitely make it a priority upon visiting. Easily one of Disney's most iconic rides, Space Mountain appears at almost every Disney theme park in the world, but with an interesting trait - they're all entirely different. Of course while identical rides may vary slightly between resorts in terms of aesthetics or minor layout changes, each Space Mountain has it's own unique theme and structure, and the Magic Kingdom's is easily the largest of the bunch with two duelling, mirrored tracks. Whichever one you find yourself on is of course completely random (though FastPass riders often find themselves on one and the rest on the other), and you'll often find yourself riding in sync with those on the opposing track. The ride features much smaller trains than other iterations of the ride, which race along the track in darkness at just shy of 30mph - of course, surrounding you are all kinds of galactic aesthetics, from planetary backdrops to distant twinkling stars. As you whizz through all sorts of sudden turns, drops, and stops, enormous speakers around the room also play kickass music by Michael Giacchino on a continuous loop; you can't always hear it that well which is a bit of a shame, but it still adds an effective atmosphere. Possibly one of the most creative and certainly one of the best roller coasters I've ever been on, Expedition Everest holds several unique accolades when it comes to Disney theme park rides; the first to travel both forwards and backwards and also home to the largest ever animatronic in Disney history, that being the 25 feet tall Yeti that riders encounter on their journey throughout the 60 meter high artificial mountain. It is also the most expensive roller coaster ever built, with a cost of $100 million upon completion in 2006. Beginning with gentle dips as you exit the station and enter the mountain itself, the ride soon morphs into something far more intense as you find yourself going backwards after encountering torn up rails at the conclusion of a small slope - as the train comes to a stop against this hazard, the track behind you cleverly flips over to divert to a new route, which, again, the train thunders down in reverse. After one final pause and change in track pattern, the train returns to forward motion once more and soars down a 80 foot drop, reaching it's full speed of around 50mph on one final chaotic circuit, concluding with a frightening glimpse of the animatronic Yeti monster just as you leave the mountain and return to safety. What I just adore about this ride is the tense pace - it really builds up to a stunning finale and, thanks to some incredible sound design, you're really pulled into a terrifying atmosphere as the Yeti antagonist stalks you on your journey. What's equally as amazing is, of course, the set design itself - the 200 foot high mountain and the intricate caverns within it work alongside said sound design to provide an atmosphere that I find to be unrivalled in other roller coasters I've been on over time. Such creativity of course extends into the track layout, with the forward and backward pattern making for a diverse and exciting ride from start to finish. Easily the best ride at the resort, and possibly my favourite roller coaster of all time. Surely this shows how much I love it? There's lot of other great stuff at Disney World, so maybe I'll do another lineup soon...we'll see.